Taylor Clos (4) goes up to shoot during the game against Oakland. Clos shot 2-of-11 on the game and had 7 points. The Norse bench added 17 points to the board. 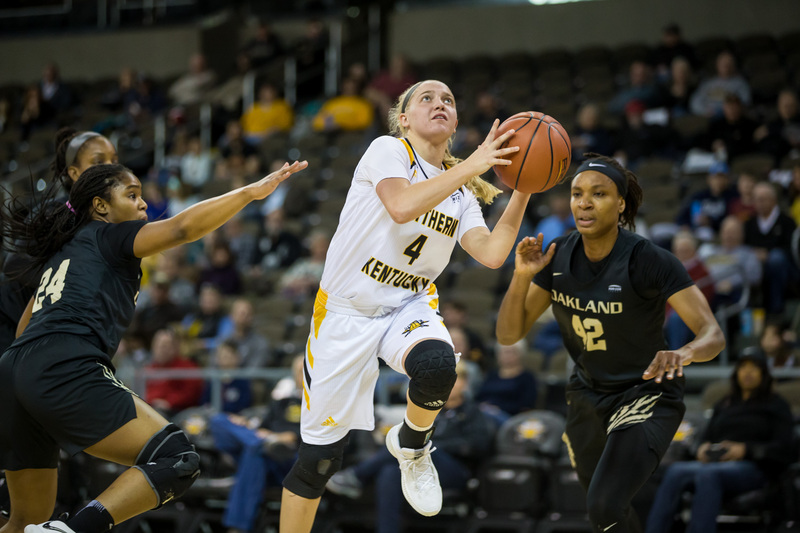 NKU women’s basketball team falls to Green Bay Phoenix, 70-42 Thursday night. The Norse fall to 7-15 on the season and 6-6 in the Horizon League. The Phoenix advance to 9-2 in the league and 14-7 overall. Freshman point guard Taylor Clos led the night with 10 points, scoring 2 of 5 from three. Freshman point guard Ally Niece and senior guard Taryn Taugher score 7 a piece. Sophomore forward Kailey Coffey led in rebounds with 10 and added 2 points to the board. This game coverage will be updated. Never miss an update: follow @northernersport on twitter.